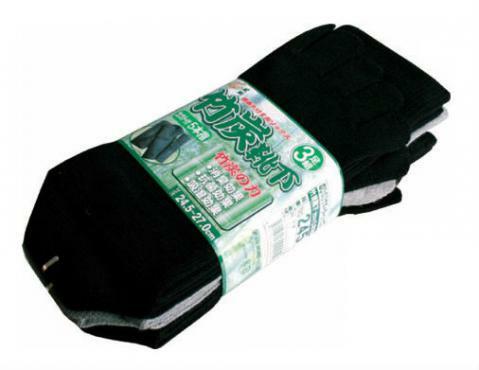 These 5-toe socks incorporate bamboo charcoal, which has multiple benefits: it fights both odor and bacteria, and it absorbs moisture, keeping your feet fresh and healthy. So these socks are ideal for sports and outdoor activities. They also feature arch support - comfortable elastic runs along the length of the instep, reducing strain and providing extra support for the muscles. And the stretch material is double-elasticated, ensuring a really good fit. These tabi socks incorporate bamboo charcoal, which has multiple benefits: it fights both odor and bacteria, and it absorbs moisture, keeping your feet fresh and healthy. So these socks are ideal for sports and outdoor activities.